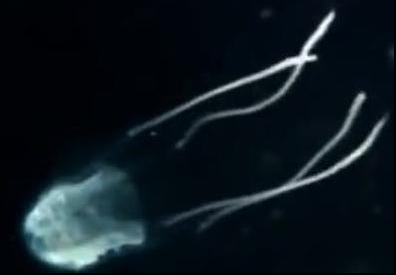 The Irukandji Syndrome is a condition induced by venomization by the sting of Carukia barnesi, a species of Irukandji jellyfish and several other box jellyfishes. The bell is transparent and only 2.5-3.5cm in diameter, making it almost impossible to see in the water. There are just 4 tentacles, one in each corner. When contracted these tentacles may be just 5-7cm, but they may extend to some 60-70cm when the Irukandji is ‘fishing' for its prey of small fish. Most stings occur during the summer wet season in October-May in North Queensland (Australia), with different seasonal patterns elsewhere. Reports of Irukandji syndrome have come from Australia, Hawaii, Florida, the French West Indies, Bonaire, the Caribbean, Timor Leste and Papua New Guinea. The cases outside Australia are presumed to be species other than Carukia barnesi. The syndrome was given its name in 1952 by Hugo Flecker, after the Aboriginal Irukandji people who live in Palm Cove, north of Cairns, Queensland, Australia, where stings are common. Because the jellyfish is so very small, and the venom is only injected through the tips of the nematocysts (the cnidocysts) rather than the entire lengths, the sting may barely be noticed at first. It has been described as feeling like little more than a mosquito bite. The symptoms, however, gradually become apparent and then more and more intense in the following five to 120 minutes (30 minutes on average). Irukandji syndrome includes an array of systemic symptoms, including severe headache, backache, muscle pains, chest and abdominal pain, nausea and vomiting, sweating, anxiety, hypertension, tachycardia and pulmonary edema. One unusual symptom associated with the syndrome is a feeling of "impending doom". Patients have been reported as being so certain they are going to die, they beg their doctors to kill them to get it over with. Symptoms generally abate in four to 30 hours, but may take up to two weeks to resolve completely.